I am attending a wedding this month and have no idea how much to give. I'm shelling out $ for other expenses related to the wedding (hotel room, car rental, bikini wax, etc. ), and don't have an unlimited budget for their gift. They've asked for cash, and I'm just not sure how much to write the check for without seeming cheap. Any suggestions? Great question - I can't tell you how complicated wedding gift-giving sometimes seems. You gave an engagement gift, a shower gift, and you flew to Vegas for the bachelorette weekend. And now you've just paid for your flight to the wedding, two vodka tonics on said flight, a rental car, your hotel room, and after all of this, you now have to write a check to the bride and groom. Where to begin? Let's begin with the Civil War. I'm kidding (sort of). Many of my Southern readers just read the question above and are saying to themselves, "wait a sec, people give cash at weddings??" Beyond the obvious differences that exist between the North and South, like fried pickles in the South vs. fried rice balls in the North, wedding culture is vastly different as you cross the Mason-Dixon line. It's likely I'll devote a separate post to this, so I'll keep it as brief as I can, but one of the biggest differences is what guests give at weddings - in the South, actual gifts, like china and appliances, are more prevalent (although checks are not unheard of), whereas in the North, cash is the gift of choice. So now that we're all on the same cultural page, let's keep going. A somewhat antiquated rule (meaning what your parents are apt to do), is to write a check for the equivalent of what the couple spent per person on the reception. There are a few problems with this rule. One, how the heck are you supposed to know what the couple spent per person? This would require a super awkward and probably embarrassing telephone call to the venue in question, and they are not going to divulge that information, as they likely think you are calling from a competing venue to get inside info on their pricing. Second, what if it's not the couple paying for the wedding? Many parents do still finance their children's weddings these days, so for the most part your "price per person" gift isn't a reflection of the couple but rather of the couple's parents, who aren't the ones cashing the check (although I'm sure they might like to). Third, why should someone who spends $500 a person receive a larger gift from you than someone who spends $200 a person, especially if the $200 bride is your best friend and the $500 bride is your third cousin twice removed who you've met all of once? In my humble opinion, there's something very impersonal about basically reimbursing a couple for the cost of your dinner, and ultimately this kind of gift isn't a reflection of the couple or of your relationship with the couple but is instead solely a reflection of the amount of money spent on the wedding. So back to our dear reader. Here's the bottom line - (you hope) the bride and groom invited you to their wedding because you mean a great deal to them and because they want to share one of the happiest and most important days of their lives with you, not (you hope) because you are their very wealthy friend who came up with this little idea called "the face book" and are now worth billions of dollars. So, with this in mind, cash in on your knowledge of the bride and groom, and pick out a gift that might not be the priciest on the couple receives, but that could be the most thoughtful. Here are a few ideas for those of you who are the "I'm not creative" types - you know who you are, and I'm not buying it - the notion that you're not creative or the wedding gift. My in-laws were the last couple married at St. Boniface in Elmont, New York. How nice would it have been for them to have a way to visit the church somehow other than in their memories? Nice, real nice. I love the idea of giving a couple an historic print or an artistic rendering of the place they tie the knot, especially if the location is of particular personal meaning (the bride's childhood home, maybe) or of special historical value. 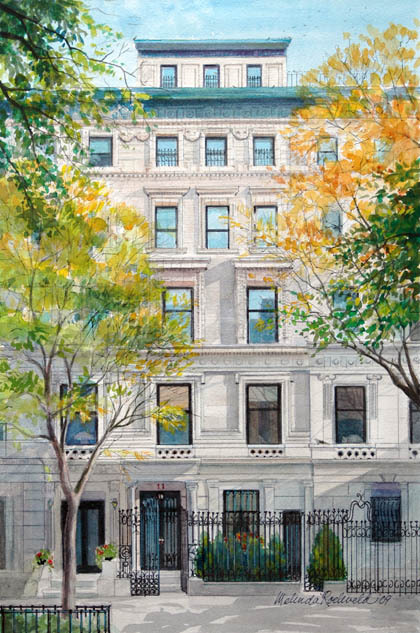 Here's an artist who paints incredible watercolors of homes and buildings. While a commissioned painting can sometimes be pricey, finding a local, up-and-coming artist or a pre-existing print of an historic property can be a much more economical option. I would offer to do it for you, but my drawing skills stink. Here are two more great options for giving a bride and groom gifts that will remind them of their wedding day. I simply adore these quilts by Haptic Labs. 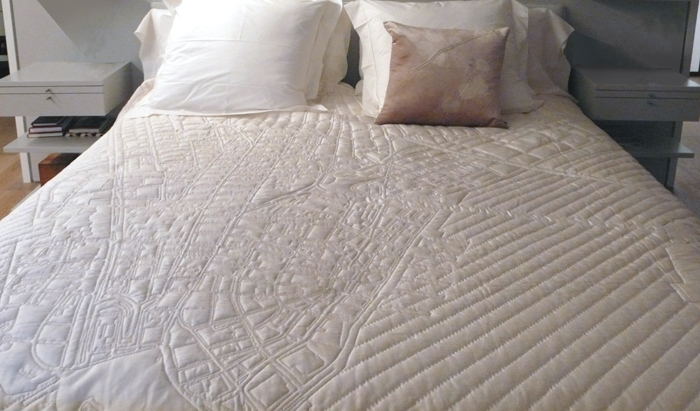 Available in color or in this more subtle monochromatic version, these city map quilts are delicious. Request a custom quilt for the bride and groom's city, or save this gift idea for the next Manhattan wedding you attend. Go in with a friend to pair this with nice bedding from the registry and you will be at the top of the couple's "awesome gifts" list. A typographic map from richmondtypemap.com where each street on the grid is actually type of the street name. Clever. There are also these popular neighborhood prints of various cities from Ork Posters, which are available in a number of color combinations. I really love surprising a bride and groom with a fun gift awaiting them at their honeymoon. Whether it's a couple's massage, an afternoon ziplining, or a romantic dinner on the beach, pick up the tab for an activity or surprise the newlyweds with a dinner upgrade at their resort. If you're not sure where the couple is honeymooning, or if any of these ideas sound like too much work (pansy), then why not give the couple a gift certificate to a restaurant in their town they've been dying to try but can't justify the cost for. Or how about a gift certificate for trapeze lessons or maybe season tickets to their favorite theater company? Wine tastings, cooking classes, a private tour of Yankee Stadium, there are so many amazing options that span quite a few price ranges and interests. My bridesmaid, Holli, surprised me with one of the most amazing gifts I will probably ever receive. I had wanted to use lily of the valley in my bouquets and boutonnieres because my in-laws had chosen these for their wedding forty odd years earlier, and I thought it would be a sweet detail to include as a way to honor them. Who knew that they were way out of season and therefore beyond expensive and out of my budget? Holli, knowing what had happened with the lily of the valley, pulled me and my almost-husband aside right before our ceremony to give us our wedding gifts - two embroidered handkerchiefs featuring (what else) lily of the valley, along with our initials in blue. You know I cried. Not only was it so heartwarming to have this little detail included in our wedding, but it also demonstrated one of the many reasons why I had asked Holli to be in my wedding in the first place - she rocks. And unlike real lily of the valley, I now have a (future) family heirloom that I can give my children to use when they marry - the handkerchief their father used to wipe snot from my face during our wedding. And, to boot, the kerchief covered all four of my "something's" - something old (lily of the valley), something new (the kerchief), something borrowed (meaning some day I'll pass it along when my children marry) and something blue (the blue embroidery). Needless to say I was more excited than the double rainbow guy. If, after all of this, you still feel like cash is the way to go, I like to implement my very own "dinner rule", meaning if my husband and I were treating the couple to dinner to celebrate their wedding at what we would consider to be a fancy restaurant, I figure how much would the tab come to for the four of us, considering three courses, cocktails, a few table shares, and a round of champagne to celebrate. I love this rule for a few reasons. Where you choose to go to dinner for a celebratory meal is, in my humble opinion, a good indicator of what you can comfortably afford to fork over for a special occasion, meaning if you just graduated from college, your "fancy" restaurant is very different than that of your cardiologist uncle's. The second reason this rule works is that it changes as you become plus (or minus) one, so if you're single, the bill would reflect three people instead of four (or five if you're Tilda Swinton).